I’m walking down the street the other day somewhere in California, and I stumble across an Audi A4 with an Illinois license plate that has black writing on it. Now, I can’t be sure of much in this fast-changing planet we call home, but I can be sure of this: Illinois license plates have red writing, typically stamped directly on top of Abraham Lincoln’s nose. 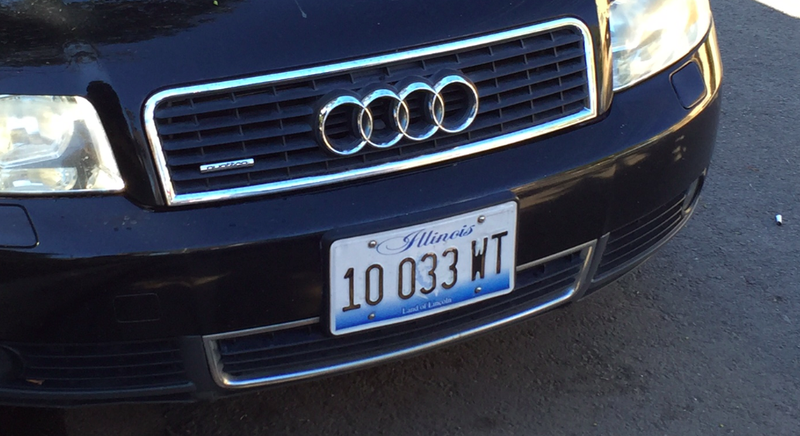 The license plate also has an unusual format that ends with the letters “WT.” What does WT stand for? Work Truck? Wiggle Taxonomy? Waving Tutu? Wild Turkey? This situation irked me enough that I decided to take a picture of it. Then I did what any normal, rational person would do when they see something that makes them curious: I forgot about it for like six months. So last month I’m going through my pictures, and I notice the Wiggle Taxonomy license plate among them. And at that moment, I committed to solving the mystery once and for all by doing what any serious, professional, highly qualified journalist would do: I began poring over Illinois state statutes, stopping only for lunch, dinner, and the occasional break for rocking out to Jimmy Eat World songs with my stuffed capybara. No, I’m just kidding. What I actually did was, I Googled it. I do have a stuffed capybara, though. Here’s what I learned: that mysterious “WT” code on the license plate I saw? It does not stand for Wild Turkey, or Whirling Taliban, or Walking Turtles. It stands for Window Tint. This is a special license plate for window tint. A person owning and operating a motor vehicle, who is determined by a physician licensed to practice medicine and is afflicted with or suffers from medical disease such as systemic or discoid lupus erythematosus, disseminated superficial actinic porokeratosis or albinism, which would require that person to be shielded from the direct rays of the sun is entitled to operate said vehicle with tinted windows. This exception also applies to a vehicle used in transporting a person when the person resides at the same address as the registered owner and the person is afflicted with or suffering from a qualifying medical condition”. However, no exemption from the requirements of subsection (a-5) shall be granted for any condition, such as light sensitivity, for which protection from the direct rays of the sun can be adequately obtained by the use of sunglasses or other eye protective devices. For those of you who do not wish to spend your time on Jalopnik reading statutes from a place where the local prison population primarily consists of former governors, allow me to paraphrase: the window tint license plate is issued to people who have a medical condition that requires them to be shielded from the direct rays of the sun. However, the statute very clearly says that the plate is not for people who have simple “light sensitivity,” which can be solved with “the use of sunglasses or other eye protective devices.” I imagine this is much in the same way that a disabled license plate is not for people who have minor disabilities, such as too much back hair, or bad breath, or they’re 28 years old and they have a capybara stuffed animal. And indeed, the Audi I saw with the Window Tint license plates had extremely tinted windows; windows so tinted that they may have actually been painted metal. This would not surprise me, as I suspect Audi charges more for “transparent windows,” as part of the same $2,400 Convenience Package that includes round tires. Now, for those of you reading this from outside North America, you might be wondering why any of this exists: window tint laws. Exceptions to window tint laws. License plates with Abraham Lincoln’s face on them. Personally, I’m not a big fan of window tint on my own vehicles, because it reduces my visibility at night. I am, however, for Illinois’ special license plate, because I believe it’s an interesting way to accommodate a disability. In fact, I think the program should expand. For example: I would qualify for an “RC” license plate, which of course would alert officers to the fact that the driver might be Rocking out to Jimmy Eat World with a stuffed Capybara.